These are the faces of The Sons and Daughters of ALLAH, The Children of that OMNIPOTENT seed planted firmly in The Heart, WE ARE ALL MOSLEMS!!! MY SPIRITUAL FATHER, TEACHER AND GUIDE. FOUNDED THE CANAANITE TEMPLE IN 1913, THE MOORISH DIVINE NATIONAL MOVEMENT IN 1916, THE MOORISH HOLY TEMPLE OF SCIENCE IN 1925, AND THE MOORISH SCIENCE TEMPLE OF AMERICA IN 1928. ALL OF MY FAMILY (LOVED ONES). 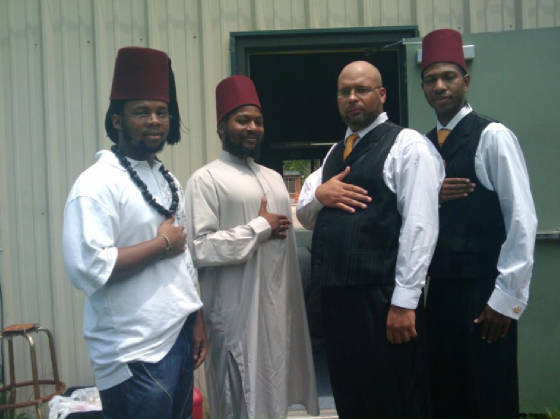 Founder of The Dominion of New Amexem and Allah's Temple, The Supreme Grand Sheik Prince Ka Saadi El. What makes a man GREAT, is The Love he shares with his family. you can measure The Greatness of any Man by how much his family Loves him. There Love makes him stronger. "LOVE THYSELF, AND THY FATHER GOD, ALLAH"
1. Iman Azikiwe Asad Hajar-El, C.
2. Sheik Melchizedek Hassin Hajar-El, GS. 3. Prince Ka Saadi EL, SGS. 4. Sheik Elisha Jahid Alim-Bey, GS. me and my brother from another mother..lol.